This year YouTube announced that it is changing its algorithm to stop recommending conspiracy videos. This is a big deal both socially and financially. YouTube has essentially acknowledged that its practices have created a social problem, which they are willing to fix at their own expense. YouTube’s revenue model benefits from those most easily addicted or drawn in - every minute watched is another opportunity for an ad to be inserted. Developer Guillaume Chaslot shared that conspiracy theorists are particularly susceptible to addiction and, consequently, train the YouTube algorithm to promote their favorite content more broadly, as if the video is seeking out other addicts. YouTube’s corrective actions are emblematic of a paradigm shift underway. Institutions are not simply trying to maximize their own revenue and societal dominance anymore. Increasingly business leadership sees themselves as accountable for their influence on the world. Most large American businesses have focused on not being complicit with negative social actions. For example, Visa and Discover stopped processing payments to hate groups in 2017. YouTube’s actions move from non-participation to active moves against pernicious societal influence. Even academia has re-considered its responsibilities to society. Academics are incentivized to maximize the number of papers published; it is the currency of professional success. Yet over the last decade a crisis of confidence has unfolded, where fields from cancer science to psychology have failed to reproduce the majority of their findings from published studies. Consequently, some journals have decided to stand for quality over novelty. For example, the American Journal of Political Science (AJPS) requires submissions to integrate reproducibility into their submissions. From academia to corporate America, leaders are beginning to lead towards a better society rather than follow raw fame and fortune. Let’s hope that the trend continues to catch on. 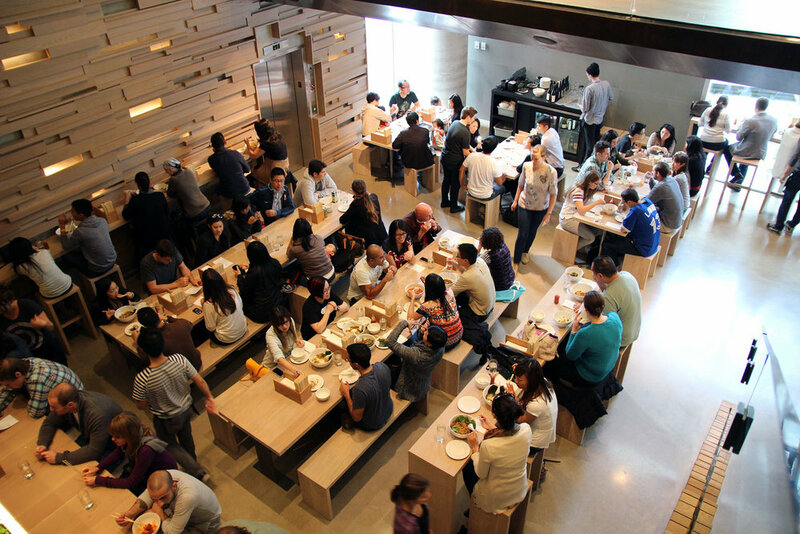 There's a visible trend of communal seating in the dining world, especially at fast casual restaurants like Dig Inn. At first I wondered if the Sharing Economy had gone too far - taking out seating real estate just like WeWork has small businesses share conference rooms and kitchens. Are these businesses just squeezing out more dollars per square foot or actually adding social value? I suspect that Dig Inn is just using timely positioning for its foot traffic goals. But others like Coup, former bar and now a pop-up bar, have leveraged the communal seating for a actionable social good. At Coup, 100% of profits go to non-profits, including those de-funded under the Trump administration. Patrons each received a token per drink with which to vote on featured charities by placing chips in jars placed along the edge of the room. Social interaction is encouraged by placing the jars on ledges behind tables. Did ideas end up being exchanged between strangers? Possibly on occasion. Whether it worked or not, I endorse the concept. And whether it happens or not at Dig Inn, I'm still eating their delicious meat balls and roasted sweet potatoes.